Figure showing the growth of published peer reviewed articles on citizen science, from 1997 to 2014. Figure from Follet and Strezov, PLOS ONE. At the start of every year, most people will have made a list of New Year's resolutions. Some of the most common this year will be to get fit, adopt healthy eating habits and spend more time with the family. But have you ever thought about using your spare time to help classify galaxies, monitor coral reefs to detect signs of disease and invasive species outbreaks or to monitor the exposure effects of air pollution? More people are contributing to scientific projects through citizen science and factor goals such as these in their 2016 plans. But an important question remains: how much of the contributed data is published as peer-reviewed scientific articles? What exactly is citizen science? A simplified definition of "citizen science" taken from the Cornell Lab of Ornithology is "a project in which volunteers partner with scientists to answer real-world questions". Projects such as Zooniverse's GalaxyZoo, where volunteers can go online to classify galaxies based on simple features, and wildlife monitoring projects such as Cornell Lab's Great Backyard Bird Count, are most traditionally associated with citizen science due to their popularity in the media. However, the term "citizen science" encompasses a broad range of types of volunteer contributions. Participation can vary from collecting ecological data ( e.g. conducting butterfly counts), to participating in research as a study participant (e.g. the crowd-funded research project American gut requires participants to use specialised kits to take swabs from their own body which are then sent off for analysis, to help microbial researchers understand the microbes that inhabit the human body). Citizen scientists can also choose to contribute through a more passive approach, such as by simply providing spare computing processing power for data analysis (e.g. in order to participate in the SETI@home project, that analyzes radio transmissions to search for evidence of extra-terrestrial intelligence, individuals are simply required to download software onto their home computer). Although the term "citizen science" is relatively new, the act of non-expert volunteers contributing to research has a long tradition in science. One of the longest running citizen science projects is the Christmas Bird Count. Managed by the National Audubon Society, the bird count was originally set up in 1900, when Americans who traditionally hunted birds begun to count them instead. The ever-growing reach of the Internet and advances in technology have equipped scientists to extend the scale and scope of their projects and broaden engagement with volunteers (or "citizen scientists"). For example, to make data processing more appealing to potential citizen scientists, some projects are asking volunteers to participate to scientific research by playing games. In 2014 Cancer Research UK launched the game "Play to Cure: Genes in Space". At first glance, this may seem like a typical space adventure game. But by collecting the fictional substance 'Element Alpha', participants are actually spotting patterns from gigabytes of DNA microarray data collected from tumours, to highlight genetic faults that can lead to cancer. In a 2015 study published in PLOS ONE, Ria Follet and Vladimir Strezov conducted an analysis of peer-reviewed articles on citizen science, to determine the growth and range of publications using data contributed by citizen scientists. Surprisingly, there is still no definitive term to describe "citizen science", and currently it can be applied to a wide range of projects involving volunteer participation. This in itself is problematic, as without a clear definition this can cause issues with establishing credibility and securing funding for scientific projects. In their analysis, Follet and Strezov excluded articles that used the term citizen science to describe topics such as surveying citizens to provide input for scientific research, crowd-sourced funding and providing science education to citizens. Articles were classified as relating to either action, conservation, investigation, virtual or education, according to Wiggins and Crowston's typology, then articles were classified into topic, in order to investigate the trends in publications over time. In total, 1127 unique articles were reviewed, from these 239 were excluded for not being directly related to citizen science (as above). Follet and Strezov reported that the first citizen science article was published in 1997. In the years following, few articles were published until 2007 during which 6 papers were presented at the Ecological Society of America Meeting. After this, the number of peer-reviewed citizen science articles increased substantially. The most widely published topic where citizen science contributed to the project was biology, with 72% of articles falling into this category. 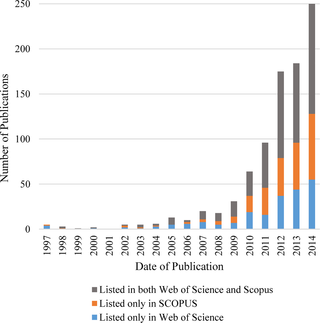 Biology-related citizen science articles also experienced a rapid growth in the number of publications, at a faster rate than all other scientific fields. The most common objectives among the biology-related articles was to assess the diversity and distribution of species, in particular birds. The findings of Follet and Strezov's study is supported by the results of a recent meta-analysis published in PLOS ONE, which identified biology, conservation and ecology as the primary fields utilising citizen science. The study also reported the highest scientific output is generated in the fields of ornithology, astronomy, meteorology and microbiology. A caveat of publishing research generated in part from citizen scientists is that many of these volunteers received no formal training, bringing the quality and reliability of the data into question. However, these issues can be addressed. Researchers can design standardised monitoring protocols to identify unreliable data, or prevent the collection of poor quality data, by using tools such as data entry forms with automated error checking capabilities. In their study Follet and Strezov found that an increasing number of publications were centred on addressing the methodologies and validation techniques researchers can use to detect errors in data and reduce the occurrence of these errors and eliminate bias. Overall, the study reported the number of citizen science publications are increasing. But, according to another recent study reviewing the contributions of citizen science projects, only 12% of bio-diversity related citizen science projects contributed data that resulted in peer-reviewed scientific articles. So as it seems, there is still room to increase the acceptance of citizen science. What does the future hold for citizen science? Citizen science is becoming ever more popular and is rapidly enabling non-experts to contribute to the growing field of scientific knowledge. One of the major benefits of citizen science is that it allows researchers to utilise resources to analyse large volumes of data quickly, often with lower financial cost. Furthermore, data can be collected from a wider demographic of participants over a much larger spatial scale that researchers would not necessarily have the time or resources to monitor otherwise. The growing role of citizen scientists in research is now being recognised around the globe. In 2015 professional citizen science organisations were created in Europe, Australia and the United States, and the first Citizen Science Association Conference was held, with another one is planned for February 2017. In the US the Crowdsourcing and Citizen Science Act of 2015 was introduced to encourage the use of citizen science within the federal government. As technology develops and more people have access to the resources available over the internet, this increases opportunities to engage wider audiences in a diverse range of projects. Based on current trends, this should mean that more of the journal articles published in 2016 will celebrate the contribution of the citizen scientists around the world. Citizen science is becoming more popular and is rapidly enabling non-experts to contribute to the growing field of scientific knowledge. One of the major benefits of citizen science is that it allows researchers to utilise resources to analyse large volumes of data quickly and often for lower cost. Citizen science also allows researchers to collect data from a wider demographic of participants and over a much larger spatial scale that researchers would not necessarily have the time or resources to monitor otherwise. The growing role of citizen scientists in research is now being recognised around the globe. In 2015, professional citizen science organisations were created in Europe, Australia and the United States, and the first Citizen Science Association Conference was held, with another one planned for February 2017. In the U.S. the Crowdsourcing and Citizen Science Act of 2015 was introduced to encourage the use of citizen science within the federal government. Rapidly-developing technology and greater Internet accessibility increases the opportunities to engage wider audiences in a diverse range of projects. If the trend continues, more of the journal articles published in 2016 will celebrate the contributions of the citizen scientists around the world.